Lanky and sneering, with a sarcastic voice, Rex Holman was one of TV Western’s last classic heavies. His scary, skeletal, scarecrow-like look enhanced nearly 100 TV W esterns from 1960-1985, 99% of the time as the nastiest, most contemptible member of the outlaw gang. 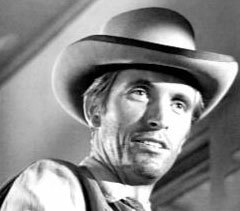 Only once can I recall Holman in a sympathetic role, that of John Hoyt’s non-violent pacifist son in “No Chip”, a December 1960 episode of “Gunsmoke”. 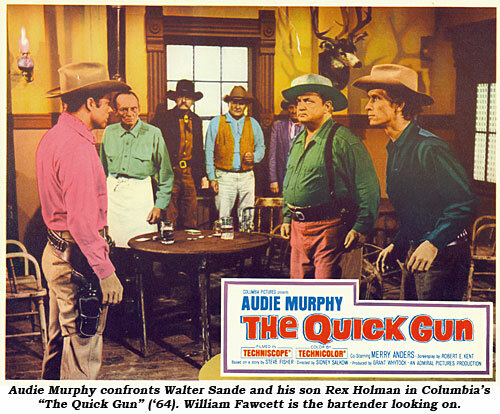 In Holman’s 16 episodes of “Gunsmoke” and dozens more he effectively portrayed twisted outlaw pond scum. Holman was a deviant we loved to hate. Born in 1935 in Tulsa, Oklahoma, his real name is Roy Baker, a name he used in a couple of early screen credits including “Ma Barker’s Killer Brood” (‘60). His family came to California during the depression years seeking employment “ala ‘Grapes of Wrath’” as Holman once put it. He graduated from Canoga Park High School and attended Pierce Junior College in Woodland Hills, California, apparently in the evenings. He lived in Tarzana, CA during his youth and prior to becoming an actor. While attending high school he met a number of actors and celebrities in the film industry which gave him access to sets at 20th Century Fox through the father of a mutual friend. Later he was employed by a film editing company in Hollywood which undoubtedly gave him insight into acting on screen. According to a friend in his younger days, Ralph J. Herman Sr., Holman when employed in the industry as a actor moved to the Thousand Oaks are and Herman understands Holman acquired several parcels of real estate. Holman apparently later moved to Hesperia, CA. His first thought of theatre work was to “rid myself of complexes.” Holman worked in little theatre, college theatre, community theatre and summer stock, all of which gave him a good background for his screen work which began with several TV episodes in 1959. On a cast information questionnaire in 1959, Holman stated his ambition was “to use my talents to the fullest,” with his hobbies listed as flamenco guitar playing and dancing. 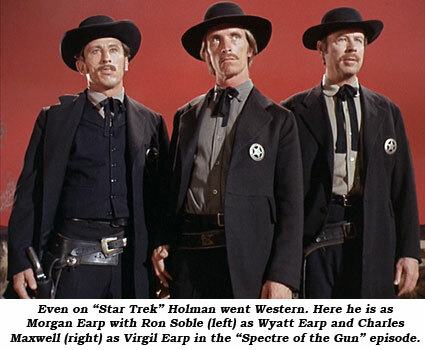 Besides Westerns, Holman worked on “Thriller”, “Twilight Zone”, “Ben Casey”, “Man From U.N.C.L.E.”, “Outer Limits”, “Star Trek”, “Mannix”…in other words all the top shows of the ‘60s and early ‘70s. His last TV work seems to be on the short-lived “Wildside” Western in ‘85 and his last film was “Star Trek V: The Final Frontier” in ‘89.